It’s time to lay to rest the only 2018 we’ll ever live through. To me, it still seems like it’s only getting started; that might mean that my mind was occupied over the past year, but all the same it’s still crazy to think that it’s over already. There has been an unfortunate downward trend for me when it comes to watching through anime series. I don’t think this is from lack of interest or enjoyment, since there were several series I watched this year which really grabbed my attention. I think the issue is more with finding the correct allotment of time to devote to these series. When a week is spent fully focused on work with only a few hours a day available to spend on entertainment, I’ve found recently that it’s more fun to spend that time on something a little more engaging. I didn’t watch anything this year that I disliked, but out of the few series I did find the time for, there were admittedly a couple which seemed to run together. I spent more of my free time over the past year playing video games over watching anime, and in saying that I don’t mean to imply that anime wasn’t in a good place, but rather that 2018 was a killer year for games. There was a perfect balance of fresh and new experiences, with an equally great mesh of single and multiplayer games, and there was also a great mix of interesting indie-level games and grander, big budget ones. Games like Monster Hunter World, Dragon Ball FighterZ, Black Ops 4, and would you know it, even World of Warcraft sucked away countless hours of my time, and the year ahead has a great deal of potential ahead as well. Here is a list of all of the anime and video games I talked about here on the Soapbox over the past 365 days, listed in alphabetical order! Click the name of an anime or game to open a tab for the article or video in which it was mentioned. If you’ve been around for awhile, you understand not only my feelings for “…of the year” awards, but also the silliness of doling out awards as such for a site like mine, considering the anime series and games I cover aren’t always released on the year in which they’re covered. Nonetheless, it’s cool to give a shout out to some of the things which exceeded my expectations over the past year. Here are some easy recommendations! 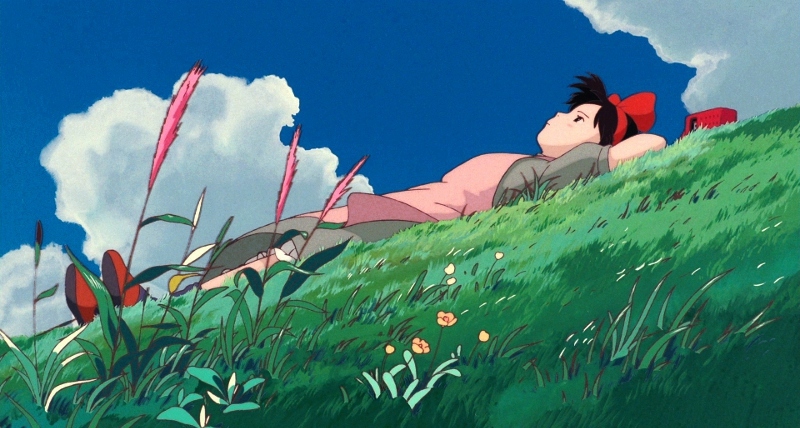 I’m the sort of person who feels foolish lauding something which is already well established as great, and I feel obligated to preface every mention of a Studio Ghibli work with “Yeah, I’m aware you already know how great this thing is.” It truly is a marvelous feeling though, watching through one of these stories for the first time, and Majo no Takkyuubin is no exception. Personal growth is important, and I think that when we’ve given up our willingness to invite new experiences and information into our lives with a childlike curiosity and openness, we’ve become much lesser versions of the people we should be. I grabbed a copy of this movie right before my workload hit its hardest, and it took me longer than expected to get to, but by the time I got to it, watching through this movie was exactly the sort of refresher I needed. Once you get your head around the idea of someone as young as Kiki being booted from home and expected to become a productive member of society with but a purse of pocket change, a broom and a handheld radio, this is a story which wonderfully encapsulates the uncertainty and overwhelming feeling of leaving home and being the person you think you want to be, and does so with a warm, vibrant, down to earth style. There are numerous lenses with which one might watch this film through, and I think some of the most appreciable works of fiction are those which can appeal to numerous different kinds of people, both old and young, without disparaging any of those groups. Whether you’re just looking for smooth animation, beautiful artwork, memorable characters, a warm tone, or a place to relax and think things through a bit, this is a film which I think has already proven its ability to hold up over time, and has already nestled itself snugly within in my collection as a feel-good movie. I’m a jerk when it comes to comedy. I’m a dreadfully sarcastic, endlessly self-demeaning, and meticulously dull person, and this carries over into my comedic tastes. 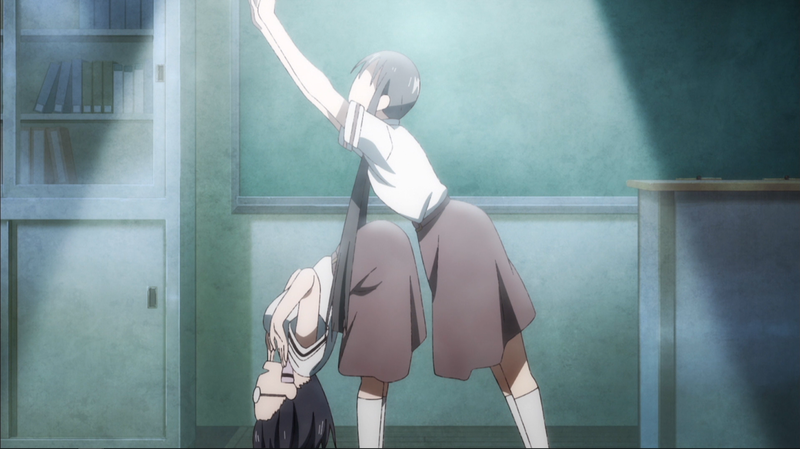 Asobi Asobase had a rough start, with gags that felt a bit forced, and delivery that seemed above its content. I was happy I stuck with it though, because while it isn’t the most consistently funny series out there, some of the situations our heroines find ourselves in still make me chuckle just from recalling them. One in particular I remember gradually becoming more and more ludicrous as time went on, leaving me laughing out loud for minutes afterward. The art style is nice, but the characters have a very bland sort of look to them, but I think that just lures you into a false sense of normalcy, and makes the ridiculous happenings all the more entertaining once they occur. This was the series I expected the least from, but got the most out of. Looking back, and considering the series I watched over the past year, I didn’t watch many series which failed to meet any sort of expectation, but I think a lot of the reason for that is that I didn’t watch anywhere near as much anime as in previous years. My personal collection grew, and my various backlog and simulcast watchlists on streaming services expanded, but my ability to set aside the time to actually get to any of it was lacking. Quite the difficult problem to have, when you manage a anime-focused site. It’s tough out there for fans of Lovecraft, but it’s been getting easier over the past few years. 2015’s From Software gem Bloodborne took the concepts posed by Lovecraft’s cosmic horror stylings and wove them into a game laced with gruesome sights and tense, exhilarating gameplay. There have been indie games here or there using Lovecraft’s mythos or tone as a base, such as the zeafaring adventure Sunless Sea. 2018 gave us a first person horror adventure game based on Call of Cthulhu (or more specifically, the pen & paper game of the same name), which is admittedly a bit rough around the edges, but has its heart in the right place. But when it comes to capturing the morbid tone of Lovecraft’s specific brand of horror, with its odd, overly dramatic vocabulary, and at times, almost over the top delivery, nothing has come close to what Darkest Dungeon achieves. This is a game absolutely overflowing with beautiful artwork, finely tuned gameplay mechanics, fantastic music, and maybe above all, unforgettable voice work by narrator Wayne June (Look up him up on Youtube at some point. He’s just the best.) It is a rare piece of entertainment which has its brilliant ideas, sure, but also has a team every ounce capable of capitalizing on those ideas and crafting them into something special backing it. The gameplay is simple: You recruit and develop a roster of heroes while also building up the various structures at your base of operations. These structures upgrade your roster and give them a means to cure the physical and mental ailments they’ve gathered in combat. Combat is your typical turn-based fare, with plenty of opportunities to customize each of your heroes abilities and equipment to fit a specific role. Death and insanity are the primary opposition, and Darkest Dungeon is nothing if not challenging. That challenge rarely feels unfair however, and while heroes can (or to be honest, will) die, more are always available to take their place, and unless you’re playing on the game’s most punishing difficulty, there is no overall fail state to speak of. Death is less an insult and more a matter of course, and as the game proceeds, you become numb to it. This is a game which ultimately wants you to succeed, but demands that you earn your success, which is a concept that is sorely needed in games nowadays. I’m not the fighting game guy. I never was, and never will be. That said, it would be foolish to overlook what a peerless showing Dragon Ball FighterZ brought. Even as someone who on several occasions (plus one following this game’s release) attempted to get into Dragon Ball Z and couldn’t deal with its rough pacing, this game’s ability to draw in players with smart fan service, easy to pick up gameplay and ludicrously over the top visuals isn’t to be overstated. Whether you’re into the anime or not, this is a fighting game impossible not to appreciate. Across two platforms, I sunk dozens upon dozens of hours into FighterZ, slowly learning the ins and outs of its fighting system, laughing and shouting with friends as countless over the top moments took place. Any old doofus can jump in and hammer any of the buttons, utilizing the game’s auto-combo system, but these combos are easy to identify, and don’t do a lot of damage. Super Dashing looks and feels terrific to pull off, and is an excellent way to charge through someone spamming ki blasts, but leaves you wide open to anyone looking to counter it. A tremendous amount of care was clearly placed in not only catering this game to the type of person willing to spend hundreds of hours in training mode to eke out any small increase in damage in a combo, but also to any fan of Dragon Ball Z or fan of massive explosions of color and chaos. The transition from one end of the spectrum to the other is a very entertaining and rewarding one, and while the fighting system is by no means perfect and the roster is by no means balanced, this is a 2D fighting game which managed to steal the reigns of team based fighting right out from under Marvel vs Capcom, who used to rule that domain with an iron fist. This is easily the most I’ve enjoyed myself playing a fighting game, and there are stories yet left to tell. It couldn’t make me a Dragon Ball Z fan, but it has most certainly made me a FighterZ fan, and I’m excited to see where this series might go in the future. I’ve only put around a half dozen hours into RDR2 at this point, if that. It would be simple to put on a podcast or some other noise and burn through some side content or just mill about in the open world, but RDR2 is a needier sort of game than that. This is a game which demands your full attention. There is plenty to dislike in this game; the animation priority which has sadly become Rockstar’s M.O. makes every action a total labor; the gunplay is total, mindless, left-trigger to right-trigger nonsense; getting from point A to point B often consists of extended periods of riding on horseback with nothing going on. It’s the in between though, which is what Red Dead Redemption 2 excels at. Exploring towns or the wilds surrounding them to see what small, seemingly inconsequential stories Rockstar has crammed into every nook and cranny. Heading out on extended, multi-day hunting trips and experiencing the sorts of emergent narratives all of the best open worlds allow. Playing through the expertly realized narrative missions, which offer some of the best character work out there. There’s so much to do and see, and similar to Persona 5 last year, I didn’t have the opportunity to devote my full attention to this game in order to see its full breadth. Red Dead Redemption was one of the best games of last generation, and it pains me to say that RDR2 has the potential to be one of the best of this one, but I might never get to see it through. To get straight down to it, sometimes you’re the odd one of the bunch; the one who lacks the ability to fully appreciate something which everyone else seems to love. This is how I feel about God of War. It’s a nice looking game – clearly a huge budget and a collection of great talent came together to make this game a reality, but as an experience I was meant to sit down and play through, the end product didn’t do anything for me. If the previous God of War games were the sort of story you might find scribbled into a snot-nosed 14 year old bully’s notebook, this game instead comes off as the video game equivalent of Oscar bait. Putting Kratos into a parental role comes off as a forced tonal shift after everything we’ve seen him do in previous games, and while the voice performance behind Kratos in particular was superb, the interactions between he and this game’s numerous characters couldn’t grab my interest. The narrative didn’t appeal to me, nor did the game’s combat, which seemed to waver in a space between classic character action and Dark Souls. It feels heavy and satisfying, but I found that the enemies seemed very damage-spongey; where the animations of Kratos and the wild camera movements kicked off by the heavy hits of the melee combat made it seem like the various creatures in Kratos’ way were just being wrecked, this wasn’t always reflected in the enemy health bars, and dispatching foes regularly seemed to take an oddly long time. It’s also more an issue with me and my scatterbrained sensibilities these days than it is with God of War’s design, but any game with involved environmental puzzles immediately pushes me away. Add to that a RPG-style progression with character levels and talent trees and full weapon and armor loadouts, and it was simply too much to deal with when what I was looking for was some quick escapism and some satisfying action. I’m sure it’s a fine game in the right hands, but God of War isn’t what I was looking for at this point. Maybe I’ll give it a go at a later date and see what everyone else seems to, but for now it’s a no-go. I had this moment a little while ago where I had the thought that “Man, 2018 was a real bore, huh?”. Nothing really happened. But then when I really sat and thought about it, there was simply a huge rift between the front and back halves of the year. A lot happened; friends came and went, there were emotional ups and downs, and I almost made it the full year without a hospital visit, but it was a lopsided year with a collection of periods in which I was simply coasting along with no real goal to work toward or challenge to work through. It’s tough to be especially proud of, considering I got very little done which I wanted to do. My schedule has shifted in a way which affords more quiet free time, which again tosses open the door to video content. Whether this means more Chill n Chats or the reemergence of an old loose end I cannot say as of now, but do know that the motions are in place to get some moving images and mumbling commentary to your screen of choice in the near future. We’re staying the course into the new year without any ambitious changes, but what is established will be re-examined and reinforced. Spitz’s Soapbox is here because I enjoy to write about the things I enjoy (or don’t) and share it with those out there who also enjoy anime and games. These posts aren’t always the most expertly written, and my videos certainly aren’t the most immaculately produced out there, but if you’ve strayed onto these pages at any point over the past year and managed to find some glimmer of enjoyment in what you found, I offer you my profound appreciation. The site will continue into the new year, and I do hope you’ll come along. « What About that Resident Evil 2 Remake Demo?